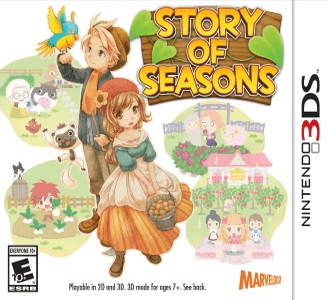 Story of Seasons, known in Japan as "Bokujō Monogatari: Tsunagaru Shin Tenchi", is a farming simulation video game developed by Marvelous Entertainment. The game is not under the Harvest Moon title in North America due to Natsume's ownership of the name. It follows along the same lines as the rest of the series, in which the player takes on the role of a farmer. The game is playable, with no crashes or game breaking bugs. No audio glitches are reported. The game achieves full speed in all areas on a mid-tier hardware since the introduction of the hardware renderer update. It’s also possible to play multiplayer by connecting two or more players using the Farm Tours feature.